By the pricking of her thumb follows on from The Real Time Murders published last year, but can be read as a stand-alone novel. Set in a future where almost everyone spends all their time in a virtual world, private investigator Alma is caught up in another impossible murder. She has been asked to investigate the bizzare behaviour of the four ultra-rich who control most of the worlds wealth, one of which may or may not be dead. There is also a body, which doesn't belong to one of the four and has had a thumb penerated by a needle. The needle injury doesn't seem to have caused the death and the coroners verdict is fairly inconclusive as far as motive and cause are concerned. Alma must juggle the investigation along with caring for her terminally ill partner Marguerite, who has to be treated with a unique medicine by Alma every four hours. There is a lot going on in this book, I wanted to start by mentioning the "big four". In this future capitalism has reached it's ultimate pinnacle and most of the worlds wealth are now held by just four people. If you think this is a bit far fetched you only need to look at the way the ultra-rich are becoming wealthier when most below them are not. Having unthinkable money and power doesn't seem to have supressed their greed. There becomes a point where it's the money itself that matters and not what it represents. Anyway, I've not read anyone who has managed to nail capitalism endgame in quite the way Roberts has here. He also nails how the power of money affects behaviour, it might not buy true happiness (although I guess that depends largely on what makes you happy), but it can can buy pretty much anything else. The juxtaposition between these ultra-rich and the Alma's own debt-ridden existence is a clear example of how unbalanced this world can be. The margin between rich and poor continues to grow in the 21st century and doesn't seem like it's going to change anytime soon. While the idea of the future of humanity spending it's time in a virtual world is hardly new, there are an increasing number of science fiction books suggesting this might be the most likely future. Given that a population plugged in is on that is ultimately under control of those running the show, I can see this becoming a reality sooner rather than later if we don't begin to restrict our ever increasing demand for consumerism and reliance on a capitalist culture. There are a lot of other ideas explored in this book but the other main theme apart from money is Death. It's something that all of us deal with at some point, and as such its something that effects us more than anything else. It's the one other thing (apart from possibly Happiness) money can't buy (well, death of someone else might be if you hire a hitman, but preventing it isn't). Yes it can help you live longer with private healthcare, expensive medicine (and armed guards) or even robotic / artificial parts. It can allow the luxury of time to keep fit, orv indeed personal trainers to teach you but in the end Death catches up with us all. Losing a loved one is hard, probably the hardest thing that can happen to anyone. Roberts handles all this heavy going with grace and humour - which brings me to the style of the book. It's inspired by the work of Kubrick, specifically 2001: A Space Odyssey, and this inspiration colours the narrative, the tempo and the structure of the story. The book even has a character called Stanley who takes Alma on a journey through parts of the film. There are also a great deal of pop culture references and it's all raised up with clever humour scattered throughout. Anyone who follows the author on twitter will know of his predilection for puns but it seems he's kept the best ones for this book. 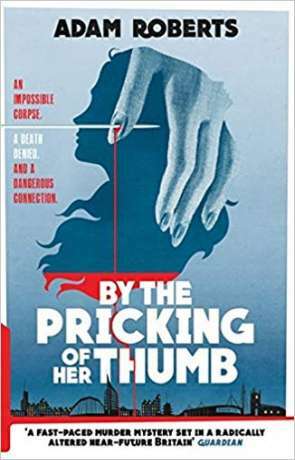 By the pricking of her thumb is a clever book, it deals with some big themes and does so in a thoughtful way that is worked into the story perfectly. It encourages and rewards the readers attention in lots of little ways, as well making them think. The more I read Roberts work, the more I realise how important he is to science fiction. Not just in his skills as a writer (although here he is a master of the language) but in the questions he asks and the statements his stories make. Impressive and important fiction. Written on 22nd October 2018 by Ant.